Cleveland Indians pitcher Trevor Bauer is fairly active on Twitter, and fans who tweet questions at him often get responses. Yesterday, one fan asked Bauer what he probably thought was a pretty innocent question until he got an eight-tweet rant in response. Bauer's actually making a very good point here. "Overthinking" is one of those hollow descriptors that fans and pundits constantly reach for when they can't come up with a better way to explain why a player is struggling. Try to think of how many times you've heard a color commentator say something like, "Well, Chip, I think the biggest problem with him right now is that he's just overthinking it" when a slumping star comes to the plate. That's meaningless! And the best sign that it carries no truth value is that no one has ever applied it to a player who's doing well. You can imagine someone saying, "Bauer is doing well right now even though his arm slot has dropped a little below where it should be ideally." 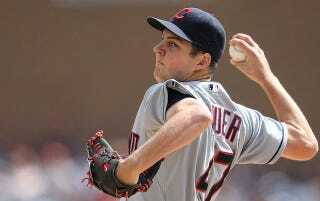 You absolutely cannot imagine anyone saying, "Bauer is doing well right now even though he's overthinking." That's because it's just a sound people make when they have no real analysis on offer.